Discussion in 'Marketplace archive (read-only)' started by darby1974, Dec 22, 2016. This may be your only chance to own one. Feel free to message me with any questions. The official releases won't make this this CD any less rare, or devalue it. The logo in the bottom right doesn't inspire me with confidence. This is being sold as real as opposed to a 'real' copy and it just doesn't sit right with me. Not sure Warners would do this type of thing - a lot of this could be helped by showing the cdr. I don't doubt the seller's integrity, but selling parts of it unseen and it being the easiest thing to create/fabricate - provenance is king! Anyone recognise that logo? - I just can't place it. Well, I went up to $300, but got outbid on the first day. This is going to absolutely rocket. There's stuff on here no one has ever heard before. Probably will be the rarest of the rare in terms of Smiths rarities, and very likely the most valuable and expensive.
" The cd-r has a paper label with a Basement Tapes logo, band name, title, and the date "1.16.06". 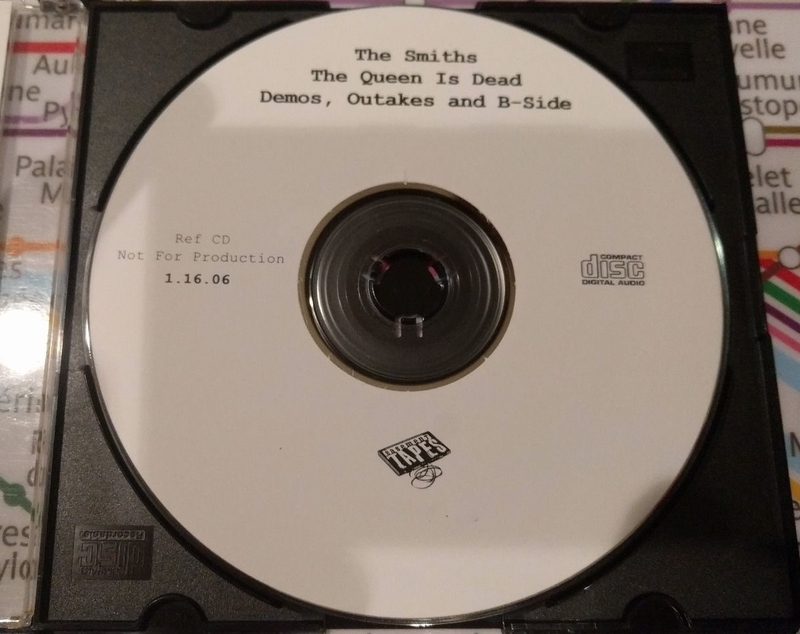 It comes in a slimline jewel case with a white card insert featuring the same information as on the cd, plus the full track listing, which goes as follows: "The Queen Is Dead" (demo), "Frankly Mr Shankly" (demo), "I Know It's Over" (demo), "Never Had No One Ever" (demo), "Cemetry Gates" (demo), "Bigmouth Strikes Again" (demo), "The Boy With The Thorn In His Side" (demo), "Unloveable" (demo), "Vicar In A Tutu" (demo instrumental), "There Is A Light That Never Goes Out" (take 1), "Some Girls Are Bigger Than Others" (demo), "Frankly Mr Shankly" (trumpet version), "Rubber Ring" (b-side), "Asleep" (b-side), "Money Changes Everything" (b-side), "Unloveable" (LP outtake), "The Queen Is Dead" (full version), "Never Had No One Ever" (take one / instrumental)." Which the disc has all this information.. Given the amount of fakery that goes on with Moz items - healthy cynicism is always prudent (especially as the Passions description is detailed enough to replicate). It will be the rarest item whilst the songs remain unreleased or until they are made available one way or another, then it will be completely worthless. The rarest of the rare remain the HIG 7" in negative sleeve and a few early test pressings (eg Reel Around The Fountain 7", etc). Indeed. My plan, had I won, was to share them. Fat chance of that now. I guess it can be considered an investment, while they are not distributed. The fact that it's a CDR, and quite generic overall, means anyone could make 10o exact replicas a day with a single junk-pile computer and a decent ink jet printer. That devalues it. That and the fact that it will be turned into mp3s eventually. Given how long some of the previous Moz cdr demos et al took to surface - the notion of people willing to share should be thoroughly applauded. Once we cross off B-Sides, already leaked stuff like Shankly/horns... what are the standout bits that constitute utterly rare!? I ask as I've not got time to go dig through gigs of Smiths stuff seeing if it is derived from this cd and local knowledge seems more appropriate. Of course he knows there is a huge demand for Smiths-rarities and a Smiths-reunion, but he just doesn't want Joyce, Rourke and Johnny getting any profit which is why he has vetoed them so far. It doesnt matter if these demos get released, This will always be one of only a handful of early reference Cds in existence, no matter how many times these demos end up getting released, reissued, put onto mp3 and so on, this CD remains rare. "It doesnt matter if these demos get released, This will always be one of only a handful of early reference Cds in existence, no matter how many times these demos end up getting released, reissued, put onto mp3 and so on, this CD remains rare." Well said and of course true. On a different note the photos posted on here are not all from the ebay-listing so there are more than one of this cd in existence. The photos posted on here are of the same CD-R being offered for sale. The seller had originally listed it with two other photos, one of which is shown at the top of this page, then terminated the listing early and relisted with the photos we all see on ebay now. Having said that, of course there is more than one copy in existence. Just a general point - besides the fact that things have been released with no approval from any band members - all of the pontificating about Moz and Smiths band politics hinges on them owning the songs outright. A simple example - Queen's music being used to sell sofas as they no longer outright own the music and were totally opposed. The full dynamics of Moz et al and Warners may never be known. How did the Hawtrey cover album ever get released if all the band held vetoes? The point being: Moz may not have as much control as people think. Thanks for the info didn´t know that. Wasn't the unloveable demo leaked last year with a bunch of other songs on SoundCloud? I reckon I told you people it's all on YouTube, you just have to spend the time looking for it. I know all you Brits and Euros are desperate, but don't waste your L, stones, or squid. I reckon maybe Morrissey & Marr Productions will do one of their "secret" corporate gigs and Warner "UK" and some of you can spend all night in a sewer and crawl up through the toilet to hear it from the restroom.